Like the look of the classic Wardian Case terrarium but hate the price tag of an actual case? The Upcycler has a project for you! 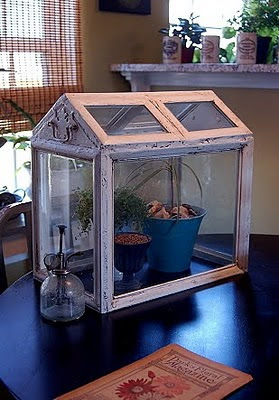 Just add old glass picture frames + a couple hours of work and presto- it's yours. Congrats to CJ at the Upcycler, his project is so clever it was picked up by Country Living Magazine and countryliving.com. And looks so good too. Clever. Yes! What a great idea, my mind is racing with designs.